Myer Centre Adelaide is a prominent landmark and the largest shopping centre located in the city's premier retail precinct, Rundle Mall. Myer Centre Adelaide is within walking distance to the Riverbank Entertainment Precinct and also in close proximity to universities and hostels, as well as the city's art galleries, museums and a casino. The property is surrounded by offices in the city centre. Anchored by the largest Myer department store in South Australia, the 501,915 sq ft retail centre houses about 80 other retail tenants. An all-encompassing retail experience, the retail centre is home to international retailers including Daiso, LUSH, Nine West, Sunglass Hut and Thomas Sabo, as well as national labels such as Angus & Coote, Katies, Platypus Shoes, Rubi Shoes and Review, and toy specialty store ToyWorld. 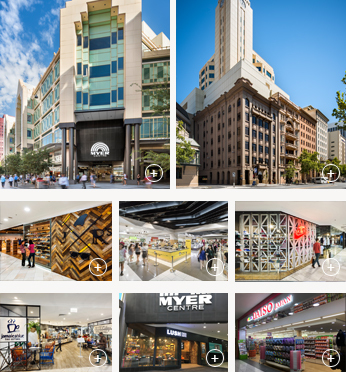 Complementing the retail experience, Myer Centre Adelaide provides a wide range of dining options with cafes and a 600-seat lower ground food court, which is the largest in Adelaide’s city centre. The property comprises an eight storey retail centre with four basement levels of car park space, and an office component, which comprises Terrace Towers, a six-storey 81,117 sq ft office tower above the retail centre and two heritage buildings (Shell House and Goldsbrough House). Completed in 1991, the property last went through a major A$35 million asset enhancement in 2013 and 2014 which included the refurbishment of the five-storey Myer department store. Myer Centre Adelaide comprises a retail centre, three office buildings and four basement levels. The retail centre is spread across eight floors and anchored by the popular Myer department store and specialty tenancies. The office component includes a six-storey office tower which sits atop the retail centre and two heritage buildings. Includes leases that have been contracted but have not commenced as at 31 December 2018. Excludes 113,000 sq ft vacant area on the highest two floors of the retail centre.